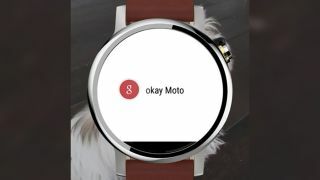 Did Motorola accidentally show us the new Moto 360? Is this the Moto 360 v2? Spare a thought for those operating the Motorola Twitter feed who may have inadvertently given us our first proper look at the upcoming Moto 360 v2. A short promo video posted to the account and then pulled showed a watch that's definitely not the 2014 model. The button is in the 2 o'clock position rather than the 3 o'clock spot for a start, and it looks like Motorola has also changed the strap system to make it easier to swap them out. Unfortunately for fans of clean lines and aesthetics, the 'flat tyre' bar that blighted the original smartwatch is still in evidence. It holds the GPU but we had hoped it might disappear in the 2015 version of the timepiece. If you're not looking closely, the short video clip could pass off as a Moto 360 v1 promo, which may be where the confusion has come from. The tweet in question is long gone but the evidence remains online. In other Moto 360 v2 rumours, a posting on a Brazilian retail site suggests that both a "360L" and a "360S" are on the way - is Motorola making two editions of the new watch to cater for more sizes of wrist? We shouldn't have too much longer to wait - the first Moto 360 was launched in September 2014 and we'd expect the second one to be arriving about a year later.